For a student of Yoga, Hathayoga provides the practical ground. The traditional of Hathayoga is a valuable gift given by the natha tradition to the world. The culy is deeply rooted in their own philosophical doctrine. goraksanatha was one of the most prominent of the natha siddhas who authored siddha-siddhanta-paddhati. The text chiefly deals with the philosophical doctrines of the natha tradition in a very systematic manner. 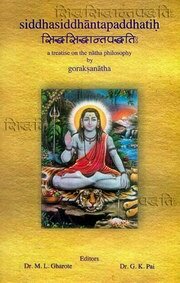 The book explain the different Layers of the phenomenal creation and the yogic understanding of the human body. It narrates interrelation of microcosm and macrocosm the substrtum of the body and the method of union of microcosm and macrocosm.It further outlines the characteristics of an avadhutayogi. Special feature of this book lies with its emphatic statement regarding the futility of all the yogic techniques if undertaken in a mechanicle manner. Dr. Manohar L. Gharote 21/05/1931 - 17/01/2005: MA, M. Ed, (Phy. ), Ph.D. (Anthrop.) Ph.D. (Alt. Med. ), D. Litt., D.Y.P., the Founder-Director of the Lonavla Yoga Institute (India) was a direct disciple of Swami Kuvalayananda. After demise of Swami Kuvalayananda, he continued to work in Kaivalyadhama in various capacities as Asstt. Director of Scientific Research, Deputy Director of Philosophico-Literary Research and Principal of G.S. College of Yoga and Cultural Synthesis for 30 years. He worked for more than forty long years in collecting materials on the Encyclopaedia of Traditional Asanas. This was originally a dream of Swami Kuvalayananda, which as a true disciple, Dr. M.L. Gharote fulfilled. Bibliographic Information: xl+206p., Tables; Figures; Appendix; Glossary; Bibliography; 23cm.